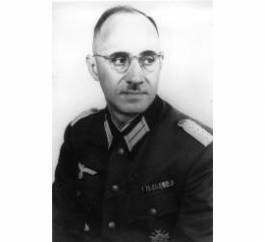 Major Karl Plagge was born July 10th 1897 in Darmstadt, Germany. Plagge graduated from the Technical University of Darmstadt in 1924 with a degree in engineering. Plagge fought in the German army in World War I. After the war ended in 1930, he took his degree in engineering and joined the Nazi party. This was an act which he would never forgive himself for. He was never an anti-Semite and in fact, he was the godfather of a half-Jewish child. In 1939 he quit the Nazi party. Later, he would come to say ”I didn’t pay any party contribution…I had come to clear opposition to the nationalist socialist methods of violence”. In 1939 major Karl Plagge was drafted in to the Wermacht at the beginning of World War II when Germany invaded Poland. There he was put in command of the engineering unit HKP562 (which had the job of repairing military vehicles damaged on the eastern front). Plagge and his unit arrived in Vilnius in July 1941 and soon they witnessed the genocide being carried out against the Jews of that area. Plagge felt responsible for the horrors that the SS was carrying out. He decided it was his duty to try and work against the genocidal regime he unknowingly helped put in to power. He decided to do what he could to help as many Vilnius Jews as possible. He did this by giving working certificates to Jewish men certifying them as essential and skilled workers regardless of their backgrounds. This kind of work permit protected the worker, his wife and two of their children from the SS sweeps. Plagge gave out 250 of these life saving permits to men. This protected over 1000 Jewish men, women and children from execution from 1941 to mid 1944. In September 1943, rumor spread that many of the Jews in the Vilnius ghetto were to be taken by the SS regardless if they had working papers. During this crucial period Plagge made huge bureaucratic efforts to form a free standing HKP562 labor camp on the outskirts of Vilnius. On September 6th 1943, Plagge transported over 1000 of his Jewish workers and their families from the Vilnius ghetto to the new labor camp. As a result of Plagge’s orders, the Jews of that camp were treated relatively fairly. Ultimately, however, Plagge and those he was trying to save were subject to the actions of the SS. On March 27, while Plagge was away on home leave, the SS entered the camp and performed a ”kinder action.” Children were gathered from the camp and taken to their deaths. The Soviet army was approaching the outskirts of Vilnius in the Summer of 1944. It became clear that before long they would come and capture the area from the Germans. The Jews in the HKP camp knew, however, that before the SS retreated, the SS would most likely kill any Jewish slave laborers that might have been left behind. They prepared to hide and conceal themselves. On July 1st, 1944 Major Plagge entered the camp and as the prisoners gathered around him, he made an informal speech. He told them that he and his men were relocated to the west and he asked for permission to take his skilled workers with them but was not granted permission. He told them that they would also be relocated on Monday July 3rd. With this warning over half of the camps prisoners went into hiding. The SS arrived on July 3, 1944 and took 500 prisoners to the forest of Peneriai where they were killed. Over the next 3 days, the SS searched the camp and its surroundings to find the missing prisoners but found only half of the prisoners that were missing. The half that was found was shot in the camp courtyard. When the red army captured the Vilnius camp a few days later, the 250 missing Jewish prisoners emerged from hiding. This was the largest group of Jewish survivors that came from Vilnius. Wermacht Major Karl Plagge was the deciding factor of their survival. Many of the survivors accredit their unusual camp commander for his significant efforts. After the war Major Karl Plagge returned home to Darmstadt, Germany. He was put to trial as a part of the postwar process. The outcome of his trial was positively influenced by the testimony of his many prisoners who heard of the charges being brought against him and sent representatives to testify on his behalf. After the trial, Major Karl Plagge lived the rest of his life very peaceful and quiet in Darmstadt. Where he died of a brain tumor in July of 1957. Falisah Ali is a student at City-As-School in New York, NY.